I have a few additional suggestions.....when posing, you can have the subjects facing the main light to provide a nice short lighting. Also, for the subjects...if you have the woman on the mans right hand side....if she were to be wearing a corsage, it will not be covered by him....also his medals will be in view from this side as well. Mark has a good point! I too have use flatter lighting for situations where speed is of the essence. On larger proms, grad dances and other such occasions there is only a small window of opportunity to get all the couples photographed before the festivities begin. With evenly exposed and lighted files, as to exposure and ratio, the printing process will be easier and there will be no necessity for adjusting color and density for each shot. Your time is better spent on making sure the posing is nice and that, as mentioned, any decorations, badges, stripes or other insignia on military uniforms show well, however, it is a good idea NOT to turn subjects in too far in, in order to show shoulder flashes. Also- some mess kits need to be adjusted so that the shirt is not showing at the bottom of the jacket. I usually have my assistant make sure all the regalia and flowers are in order before each couple step up for their photographs. Some uniforms entail hats- I usually have them held in the hands of the cadet or officer for photography unless this would be considered a uniform violation- I have not run into that for a long time. I love shooting military wedding and other functions. I find that there is a level of discipline and cooperation that makes my job easier and more organized. My apologies, I failed to catch that. Mark, do you happen to have an example of the results of that setup, including a typical high school prom background (to see how the light falls on it as well)? 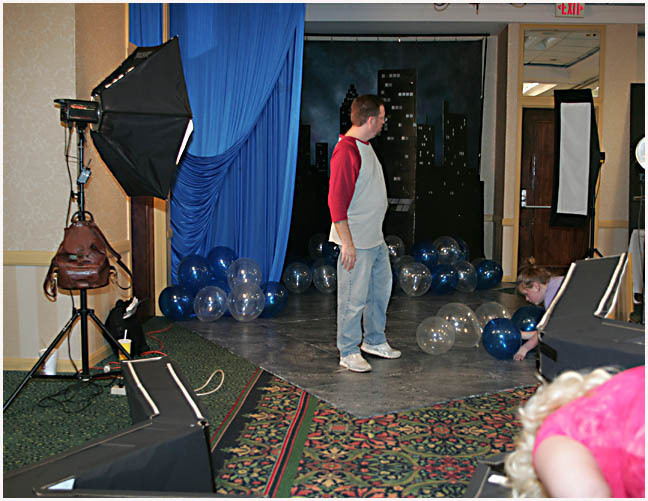 I volunteer to help with the local middle school's prom each year and might like to try that setup. I don't have a prom image handy, but here's a recent sport league shot (I shoot it the same way. Two upbrellas, side by side, up high). The enlongated catchlight gives away my light placement. 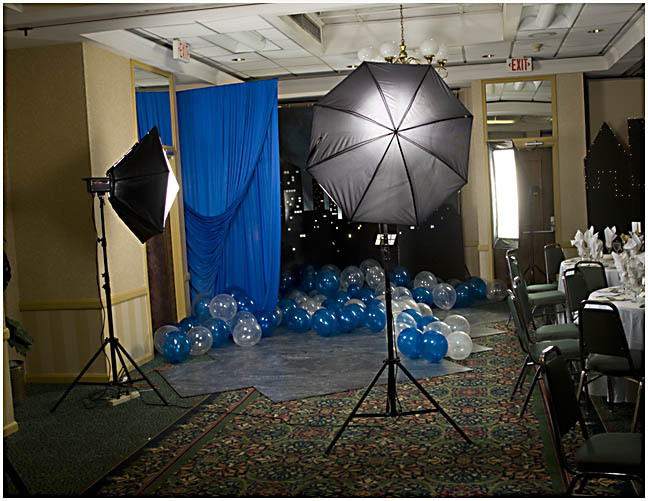 All my of pic-a-packs are shot using the lighting setup shown above. Pic-a-pack, meaning; "pick a package". These types of jobs are usually sports, proms, company parties and events where your shooting the same thing over and over, swapping out only the subjects. I agree with all that Ed says. My lighting pattern is a tad different. I learned Prom and Event photography lighting from the late, great Ken Porter. Two umbrellas, side to side, over the camera position. Easy. It's not artistic, but doesn't have to be. This is documentary style photography. There is no ratio. Both lights pump out the same amount. Thanks for the set up and example Mark, I am getting ready to do a fund raiser for my church this Easter and this set up and example has helped a lot. Clyde! Just because a lighting is a bit on the flat side, this kind of photography can still be artistic. If you will notice on Mark's image there is some modeling- as soon as you ad a second light, some modeling will occur. My set up for proms is usually at a ratio of 1:1.5. In today's sports and prom photography markets, one has to be competitive and the general price scene around my city is not to my liking- oftentimes theses folks want things for next to nothing. I will do the odd prom job or sports deal for local organizations but I need the volume to make a day's or night's work somewhat profitable. I do have to charge a bit more than the real mass-production studios and I can only get those extra dollars when the work is a cut above the rest. If you look at Mark's image you will notice nice posing and expression and great us of props such as the ball and the net. As I mentioned previously, when time is limited and I have a lot of kids to or attendees to do, I don't want to fuss too much with my lights but sometimes I may pull my main light as much as 30 degrees in order to pick up more texture in uniforms and ball gowns. With couples, of course, you don't want throw shadows from one subject onto the other. Nor do you want 'copy lighting" with 2 units at 45 degrees causing a disunity of lighting and cross shadows. Even if I am shooting fast and furious, I want my work to be indicative of what I do at weddings and studio portraiture. I call theses techniques "compromise" methods. I want my prints to have more panache than the run of the mill stuff. If I can't make a ton of money on theses shoots, at least I want good PR. When I sign on to theses types of assignments, I make it clear to the school, committee or the athletic association that I am doing this work at a significantly lower rate than our wedding and portrait photography for the benefit of the kids or the grads. I just want to make sure that folks don't come in for major work and demand prom or team rates. This is really a last minute thing so I will try to cut to the chase and give you the facts and some instructions. 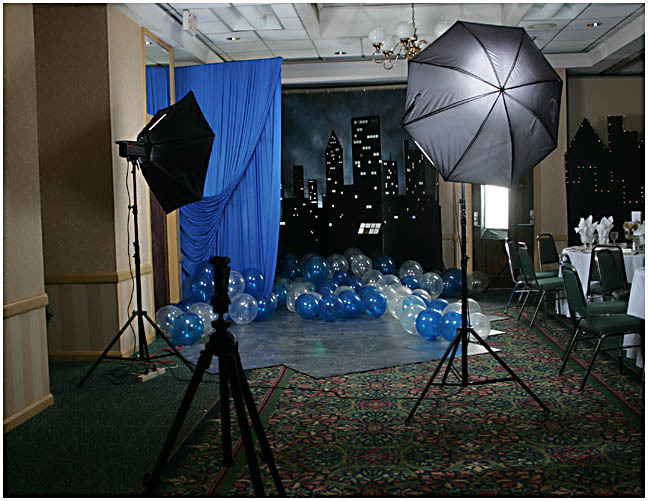 For a military ball you are going to be taking full length portraits of each couple so that you can see the dress uniform (mess kit) on the military personal and the ball gowns on the ladies. Don't shoot up or down at the couple so the camera position will be at the subject's waist level. Use a normal focal length lens or zoom setting (about 35mm). Keep the camera level so you do not get any distortion. I have attached a diagram for lighting. Get a soft box for you AB or an umbrella. Use the built in or shoe mount flash unit for a fill light and use the AB with the umbrella a the main light. Expose for the main light and power down the on camera flash so it about 1 stop lower than the main. Keep the subjects about 5 feet from the background. to avoid any shadows on the wall. If you can find a good real background such as a archway, a draped area of something with that old grand hotel look it will go well with formal/casual military portraits. It would be better to have 2 AB umbrella units but theses instructions are for what you have. I hope I am not too late bur I just came back to my studio and checked out the Email. As always, thanks a bunch for your contributions to this forum.. I have an event coming up. A fund raiser for our church, taking Easter portraits for the kids. I planned to use one of the two lighting set up's you guys have suggested. I found out today, families are asking " how many can be in this shot ?" I am told up to 6 folks could be in one shot. Will either of these two set up's still work ? I need to keep it simple to keep it moving, but I also want it to be a nice shot as well. Both systems will work but when shooting groups as opposed to couples you need to be careful not to use your main light at too much of an angle from the camera/subject axis. In fact, I would recommend that you use Mark's prefered system in order to avoid casting shadows from one subject onto the others. You will still get some modeling but the lighting will be a bit flatter and safer. You have to work fast on theses projects so you don't want to move your lights all over the place and you do want consistent easy to print files. If you have more than one row of subjects, make sure that both light are high enough to shed even lighting onn all the rows but not too high as to create shadows in the eye sockets. 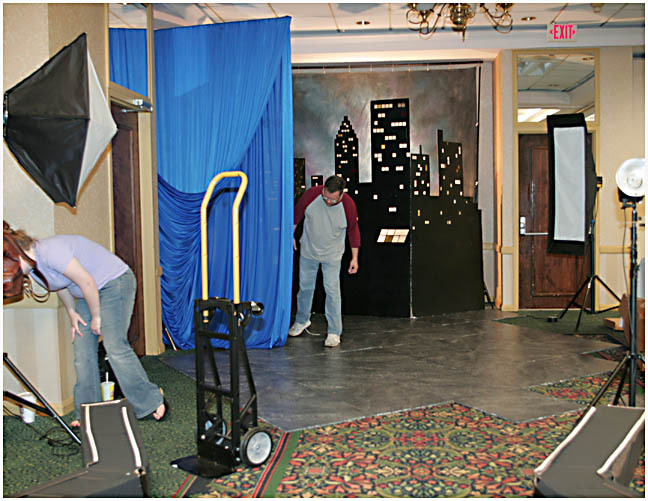 Last time I did one of those shoots for a local church fundraiser, we did groups of kids- we had some full size Easter bunnies and giant Easter eggs for props. Theses were not "formal portraits" per se but they were festive, cute and the parents donated lots of money to children's charities. At that time we used on-site printing and delivered 8x10s on the spot! 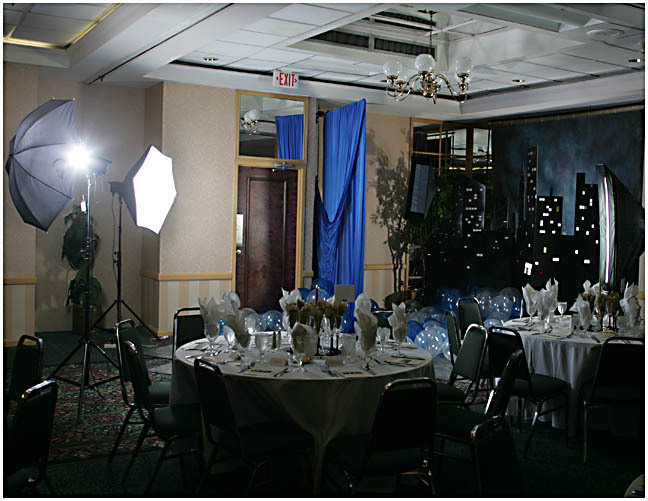 Here's a couple pull back shots from a prom... basic lighting set up as described. The theme was under the city lights... or something like that.